I am angling for a new rule in our household! Jeff is still staunchly opposed to having Milt in the bed, but I attempting to shift the "No Dog in the Bed" rule to "No Dog in the Bed on WEEKNIGHTS." This past Saturday night, we went out with friends to a party, and when we got home, both Jeff and I hopped into bed. 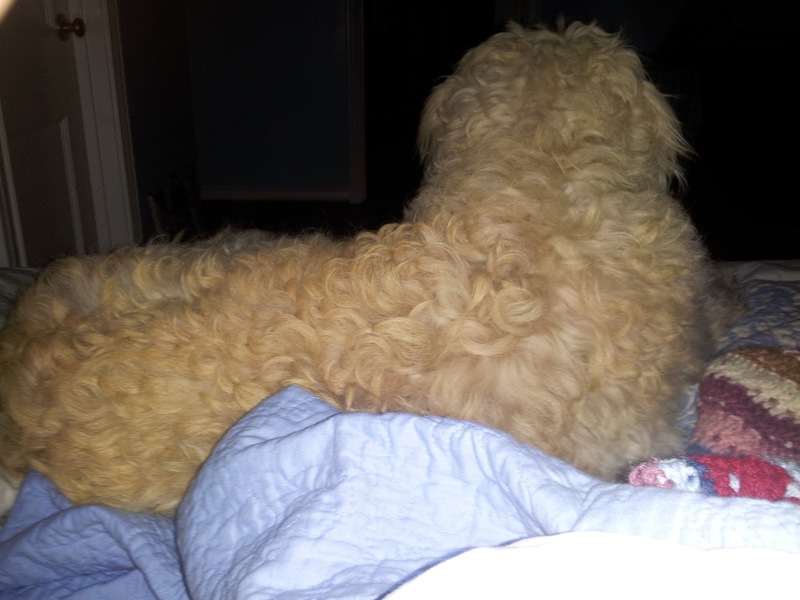 I encouraged Milt to jump up on our bed, and Jeff did not throw too much opposition my way, which was a good sign. We snuggled in with Milt between us, and, let me tell you, my Jeffery was wrapped all around that Milton. 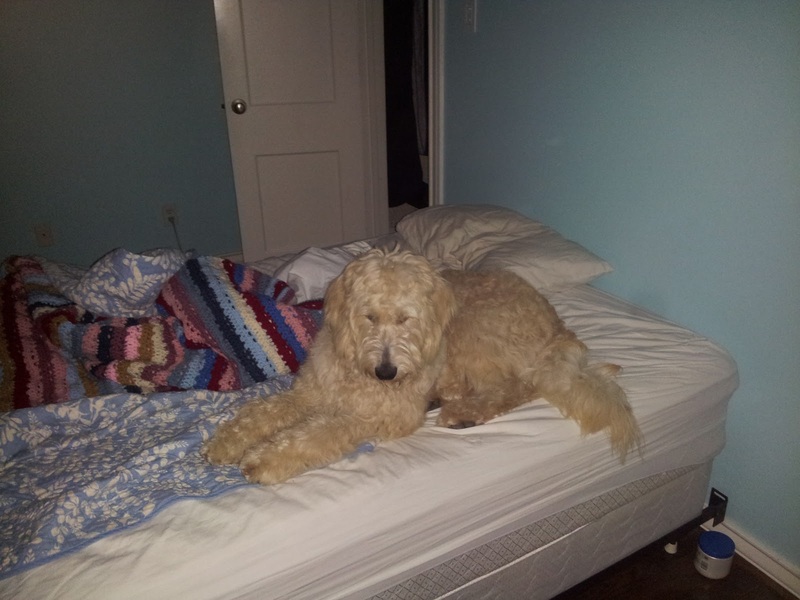 Our doodle certainly is a charmer, but at 60-lbs in our double bed, he eventually hopped out because he was too warm and really couldn't find an awful lot of good space. Midway through the night, Jeff got up to sleep on the couch due to a tender tummy (He ate a big, ole hamburger at that party, and I am surprised I felt as well as I did after consuming a fried bologna sandwich!). Of course, I cajoled Milton to get right back into bed with me, and it was the perfect space for a Momma and her dog. Wouldn't you know it, but Jeff tried to return to bed in the early morning hours. He was not as tolerant of the Milt dog this time, especially when the Milt got into scratching himself with a little bit of licking and biting while we were trying to sleep. Well, I began to doze off, and then <BOOM> I heard a thud. Milton was lying in a heap at the foot on the bed on the floor! How did that occur you might ask? I have ascertained that Jeff gave him one swift kick to claim the bed back as his own. I told my husband that there are dog protective agencies out there that would come down hard on him for something like this, but he just blew me off. Thank goodness Milt dog is the forgiving sort. I think he'll make his way back into bed this Friday again, especially when his Momma helps to pull him up! OOOOOOOOO Mommy's in trouble! We don't have dogs in the bed, either. My husband is built like a biker-Santa and he tosses and turns A LOT so Stan and Coop wouldn't have any room. If it were up to me, however, I'd have one on either side of me and DH would have his own "snoring room." I LOVE DOGS IN THE BED! Remi use to sleep with us just a little bit each night in bed when he was a pup cause he got too hot... but let me tell you... now he sleeps the entire night through snuggled up by me! I love it! Hopefully Jeff will just give up and Milt will prevail! He's just a giant teddy bear! I am cheering for Jeff. The dog will kill your kids if they try to get on bed. What does the pre-nup say??? Oh, Uncle Mark! We are going furniture shopping this weekend actually. We are in need of a queen-sized bed! I hope all is well up in New York!